Winter is upon us. As players around the world prepare for the colder weather, Magerealm is busy preparing a cool new addition to its roster! 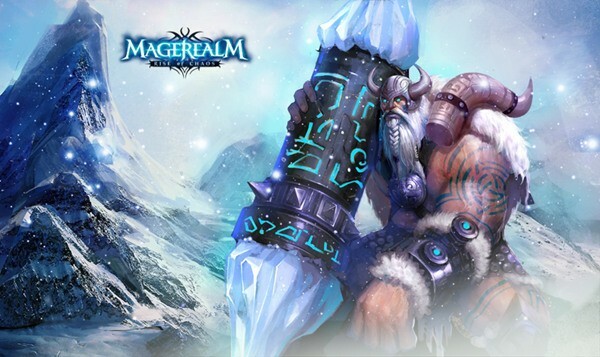 Developer GTArcade is happy to announce a brand new Hero coming soon to Magerealm, Frost Lord! Frost Lord is a member of the Jotun, or Frost Giants, and hails from the far northern mountains of the Realm. His lineage goes back to Ymir, the first Frost Giant, and one of the most ancient and powerful bloodlines in the Realm. Although the Jotun normally live in isolation and are indifferent to the affairs of other races, the demonic invasion has shook the lands all the way to the North. In response to the Mage Council’s request for aid, the Jotun king held a tournament to choose the mightiest warrior to represent his people. Frost Lord was able to defeat a hundred of the strongest Jotun warriors in ritual combat to claim his position. Crowned as Champion of the Jotun, Frost Lord was sent to push back the demonic hordes. On the battlefield, Frost Lord holds an overpowering presence; his stature alone will have lesser enemies quivering in fear. His Runic Pillar is nearly indestructible and is the perfect weapon to crush those unfortunate enough to cross this Giant’s path. Call upon the might of the Frost Giants to smash through your enemies on the way to victory! More details about Frost Lord will be released soon so stay tuned!